Powered by self luminous tritium, ambient light and battery / LED. Comes with scope cover, extra-wide Weaver style low profile 30 mm ring, Allen wrench, LensPen cleaning device, two sets of batteries, fiber-optic window cover, and polymer carrying/storage case. Re engineered, now with all-aluminum body. This is the sight you've been waiting for-- Always on. 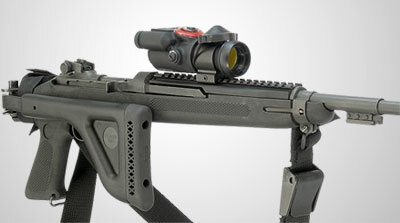 The fiber-optic system on top (shown uncovered at right) gathers ambient light for reticle illumination and adjusts to lighting conditions automatically without electricity. It has a battery powered LED backup for extra bright reticle when needed, plus a 15-year tritium beta lamp for reticle illumination in low light or total darkness. 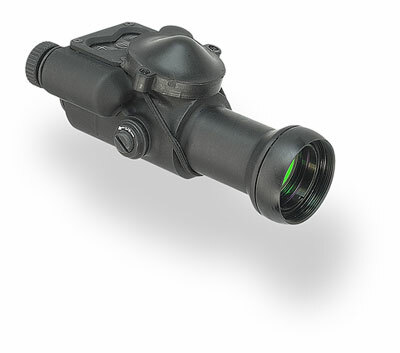 It is compatible with all current night vision devices. It will co witness iron sights on AKs, Ruger Mini-14s and Ruger Mini-30s when used with UltiMAK Mounts, and on AR-15, M-16, etc. when used with flat top receiver mounts. 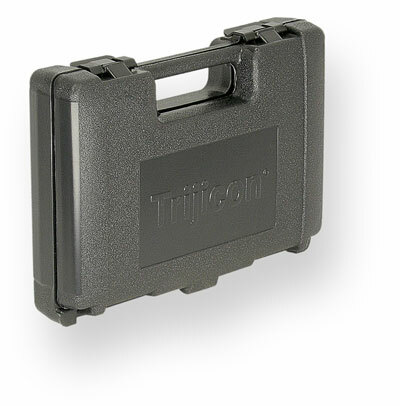 The Trijicon TX30 is ideal for the armed citizen who wants a reflex sight that is always "on" and ready to use. Military special forces units and law enforcement special weapons and tactics units will find it extremely useful as well. Lightweight (under eight ounces) compact, rugged, versatile, accurate and easy to use-- A single, failsafe firearm sighting system, it provides a fully illuminated reticle that's easy to see under virtually any lighting conditions. UltiMAK mounts provide an ideal platform for this sight. The chevron reticle, while presenting an easy to acquire and precise aiming point, also functions as a simple range estimation aid. The outside base of the chevron triangle, 16.6 MOA, is the width of a standard silhouette at 100 meters. *8.3 MOA, the width of the inside base of the chevron, is the width of a standard silhouette at 200 meters. Material - housing: High strength alloy aluminum. Eye relief: Unlimited, centering of reticle is not required. Optical coating: BBAR (Broad Band Anti-Reflective) coated lenses allow optimum light transmission for daylight, twilight, and with night vision equipment. Reticle: Chevron (hollow base triangle) 16.6 M.O.A. * wide at base, 14.4 M.O.A. high. The tip of the chevron serves as a precise aiming point. Battery Backup Controls: Hermetically and environmentally sealed pressure pad switches (3); Power On/Off, Brightness up/On, Brightness down/On. 20 settings; Fourteen day settings & six night vision compatible. Memory will return to the last used brightness setting. Power: Two 3 Volt Lithium cells type 2L76 or DL1/3N for on-call battery backup. Self luminous tritium for reticle illumination in low light or total darkness. Integral fiber optic system gathers ambient light for self adjusting, any-light operation. Battery life**: 10 hours to 100 hours continuous use, depending on setting. Adjusters are environmentally sealed and do not require covers to maintain zero or to protect the internal workings. Mounting: One wide ring, 30mm diam., Trijicon A.R.M.S. QR throw lever ring, or A.R.M.S. carry handle ring.